I want to share with you a simple, free upgrade I made to my pantry. My pantry used to be one of the most organizationally dysfunctional spaces in my house. I did a massive pantry re-organization back in August 2010, when I literally emptied it, cleaned it, and re-arranged it in a way that works for our family. You wouldn't believe how proud I am that this space has stayed organized since then! Sometimes it gets a little bit cluttered, but it's never again gotten out of hand. You can read all about my low-cost, real-life pantry organization project here. Isn't that the cutest thing? I was lucky that my doors all have these nice panels, so I simply taped off and painted the top panel. But this would be easy to do with any kind of door. And with painter's tape, it would be easy to mask off just about any shape and fill it in with chalkboard paint. Just be sure your painter's tape is stuck down good and tight. Use short lenghts of tape pieced together to form curves. For an ultra-smooth finish, apply the paint in several thin coats with a foam roller. Easy as pie! As you can see, I'm already using it to keep up with grocery needs. But I'm thinking it might also be a good place to use a little inspirational note or just to say "I love you" to anyone who might be pantry-stalking. Maybe an inspirational poem would look better than a list including onions, garlic, and grits. Food for thought! Nice Pantry Richella! I liked your chalkboard that you did on the back of the door. And I also liked the "Thank You for our food"... lettering on the wall! You are clever girl! 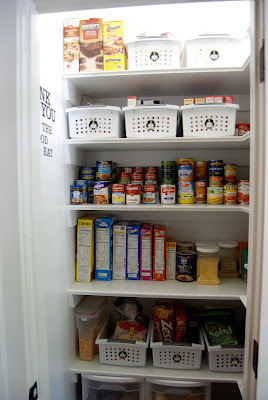 I loved how organized it was...I need to do that to my pantry/cupboards. Creative use of your pantry space. Love the chalkboard shopping list. Such a great idea! I need to do that inside the doors of our pantry too! Right now the boys soccer schedules and their school lunch menu are taped inside the doors...but a chalkboard would be fun too:) I love the vinyl saying on your wall too. Perfect for the kitchen! Love it, Richella! I need to organize our pantry here better. The hubby hates the wire shelves so we will be doing something with those. I do want to hit the dollar store for some of their storage bins to help out, too. I need to go back and see your post on organizing it. So clever!! I'll never tire of chalkboards, so fun and functional! I love the chalkboard idea! Thanks for sharing! Richella, love the chalkboard door in you pantry. Wish my door could be done like that, but I have bi-folds. Thanks for sharing at Wow.